A last-minute agreement can still be expected, which would allow avoiding a disorderly Brexit on March 29th, 2019. This could take the form of a ratification of a revised Brexit deal by the UK Parliament on February 14th or slightly later; an extension of Article 50 to July or December 2019. Given the EU’s tough stance on renegotiations and the tigh dead-lines, an extension of Article 50 looks increasingly likely. 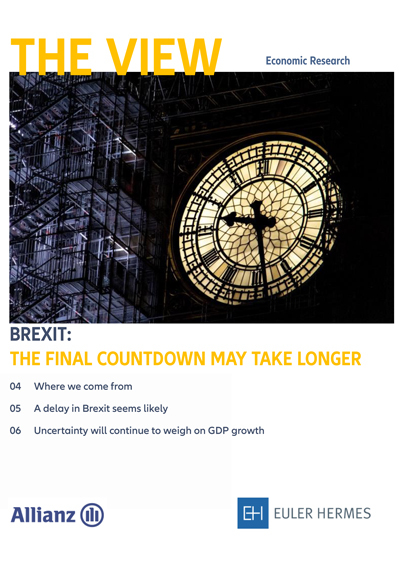 A decision to extend the exit date, opens 3 relevant options: a renegotiated Brexit deal allowing the UK to exit the customs union after a predetermined period of time; a second referendum; a softer Brexit following a change in political leadership. While the cliff-edge scenario will likely be avoided, the uncertainy about the conditions of an exit and the trade relations after exit will remain significant. The reluctance of investors and dampening effects on trade will presumably cut annual real GDP growth by 0.3pp leading to an aconomic growth of +1.2% in 2019 and +1.0% in 2020.